A number of double-flowered varieties of the common peach were available at this time, and this may be an introduction from China or an older variety. In either case it is a spreading, deciduous tree with solitary, bowl-shaped white, pink or red flowers, before the leaves, in spring, followed by edible red-blushed fruit. [RHSE, Hortus]. The variety grown by Macarthur is unknown but the discrepancy in dates means that it cannot be one of the very double forms introduced by Robert fortune in 1845. The following descriptions are of the highly decorative forms introduced by Robert Fortune in 1845. ‘This is the most beautiful of all double rosaceous trees, and when gently forced so as to bloom in February it is one of the greatest ornaments of the Conservatory. My tree in a thirteen inch pot blooms every year admirably, and gives me a good crop of its curious fruit. They are juicy and really agreeable, although not rich or high flavoured’. [Gard. Chron. 1855]. Amygdalus persica flore semi-pleno, the ‘Double Chinese Peach Tree’, is figured in Paxton's Flower Garden. At this time 5 varieties were grown by the Horticultural Society in their Chiswick Gardens, described as large semi-double crimson, large semi-double rose, large semi-double red, small semi-double red and small semi-double white. The large semi-double crimson and small semi-double white were introduced by Fortune. [PFG pl.13/1853]. The Gardeners Chronicle described one of these varieties as a ‘stout, clean-growing peach-like shrub or small tree, laden profusely with long branched racemes of the loveliest rich, peach-coloured blossoms.’ [Gard. Chron 1849]. It was recommended for forcing in pots, as ‘one of the earliest to greet the dawn of spring’. The Gardeners Chronicle further reported: ‘When Mr. Fortune was in China for the Horticultural Society he obtained that beautiful spring shrub the double Crimson peach. But the Chinese have several varieties of equal or greater beauty, one of which, with bright rose-coloured flowers, has just flowered with Mr. Glendinning. It has firm petals, rather deeper towards the edge than near the centre, and has a perfectly double calyx; that is to say, one cup stands within another as in a “hose in hose” polyanthus’. [Gard. Chron 1956]. This plant is figured in the Illustration Horticole. [IH p.204 vol.6/1859]. Flore des Serres figures a number of varieties of the double blossom china peach. [FS f.969/1855. FS f.1299/1859. FS f.1300/1859. FS f.1349/1860]. Amygdalus persica flore pleno, as introduced by Robert Fortune, is figured and described in the Floricultural Cabinet as ‘a semi-double peach from China, with very handsome dark crimson flowers, perfectly hardy.’ [FC p.83/1858. FC p.175/1859]. Listed in all published catalogues [T.53/1843]. The double-flowered peach was usually grown for its blossom rather than its fruit, but was used in hybridisation work by William Macarthur. This again suggests that Macarthur grew a form rather closer to the true fruiting peach. Such was the impact of Fortune’s introduction that it is highly likely that it was grown at Camden soon afterwards. The peach has been cultivated in Europe since ancient times but in the 1850s there was considerable correspondence in the pages of The Gardeners Chronicle on the fruiting of flore pleno and the value of its fruit. These were the final words: ‘I beg to inform you that I have some trees which ripen the fruit generally every year; and although the fruit is not very palatable from the tree, it makes a most excellent preserve, when preserved in brandy &.’ [Gard. Chron. 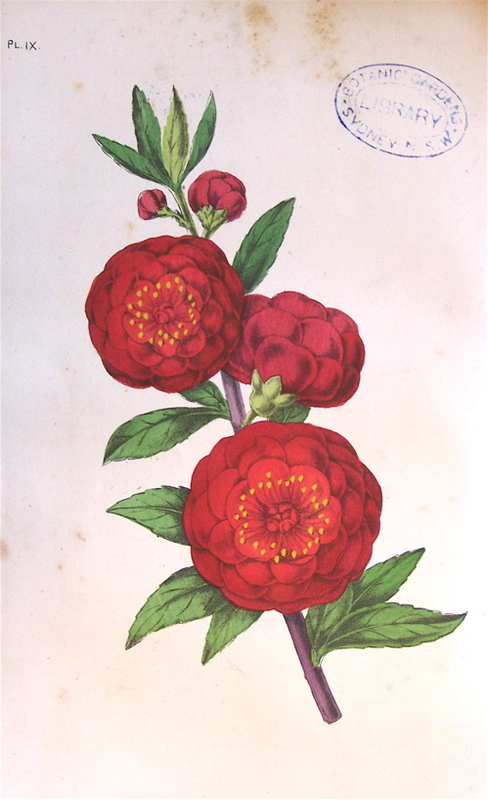 c.1856] Persica sanguinea plena, described by Johnson's Dictionary as introduced from China in 1845 is Fortune’s introduction. Amygdalus persica var. sinensis Hort.